The following is Paul Washer’s account of the early history of the HeartCry Missionary Society. “Beloved, you are acting faithfully in whatever you accomplish for the brethren, and especially when they are strangers; and they have testified to your love before the church. You will do well to send them on their way in a manner worthy of God. For they went out for the sake of the Name, accepting nothing from the Gentiles. Therefore we ought to support such men, so that we may be fellow workers with the truth." As I read through this passage, I began to ask myself how it should be applied. Should North Americans send only North American missionaries on their way in a manner worthy of God? Is it biblical for Christians in developed countries to help indigenous missionaries in less developed areas of the world? Should our abundance be used to help them minister in the midst of their poverty? As I began to discuss these questions with other cross-cultural or “foreign” missionaries, I was both encouraged and cautioned. The greatest or most frequent reservation that I heard was that if indigenous missionaries were given economic support they would become dependent and would no longer trust in God. I was also given many examples of foreign missionaries who had attempted to support indigenous missionaries, but with little or no success. The indigenous missionaries who were supported did not meet the qualifications of a minister given to us in I Timothy 3:1-7. They should have never been in the ministry in the first place. The foreign missionary who supported them was as much at fault as the unqualified national. It is for this reason that the Scriptures warn us not to lay our hands too hastily upon anyone (I Timothy 5:22). The indigenous missionaries who were supported did not demonstrate a genuine calling. They were not men who were diligent to present themselves approved to God as workmen who do not need to be ashamed, accurately handling the Word of Truth (II Timothy 2:15). They were not working in the harvest prior to a promise of support. The indigenous missionary was often hired by the foreign missionary to serve as little more than an errand boy. I have seen indigenous missionaries who were called by God to preach the Gospel reduced to nothing more than a house servant hired to wash the foreign missionary’s car, clean the missionary compound, and take the missionary’s wife shopping at the market. 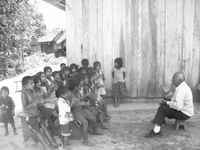 The foreign missionaries who attempted to support indigenous missionaries often neglected to involve the local church. The foreign missionary alone does not have the right to call out, approve, or send out missionaries. This is the work of the local church and its elders. As I studied the failed attempts to support indigenous missionaries, I began to see that the blame lay primarily at the feet of the foreign missionaries and foreign missionary agencies that approved these attempts. The failure was not the result of supporting indigenous missionaries but the result of violating countless biblical principles and the prejudice of some foreign missionaries who treated the indigenous missionaries as inferiors. As I considered the support of indigenous missionaries, the one truth that kept coming to the forefront was this: the indigenous local church and its elders must be the key figures in the work. It is not wise to support indigenous missionaries in a country, people group, or geographical region unless God opens the door to work through indigenous pastors, local churches, or a fellowship of churches that have an established and enduring national or international reputation. The HeartCry work in Zambia is an excellent example of this principle. Conrad Mbewe of Zambia is a highly respected pastor whose reputation extends far beyond his own country. He and his church are responsible for training missionary candidates, ordaining them, sending them forth, and holding them accountable on the field. The demands they place upon their missionaries and the degree of accountability to which they hold them far exceeds most other missionary-sending agencies. They have the expertise to train missionaries, the endurance to work beside them in the field, and the wisdom and boldness to hold them accountable. What they lack are the financial resources that can be found in the West. The HeartCry Missionary Society works with men like Pastor Mbewe to provide what is lacking so that the Great Commission might be fulfilled. The need to work through local indigenous churches and their elders cannot be exaggerated. Many pastors and other concerned Christians from the West sometimes visit third-world countries and see the economic poverty of the churches and their ministers. They return to their home churches in the West and enthusiastically raise money to support the indigenous missionaries they have known for only a few days. Sometimes it works out, and the Kingdom of God is advanced; more often, the whole enterprise ends in discouragement. A few months of correspondence begins to reveal the true character of the missionary. He is not as qualified, dedicated, or selfless as first supposed. Support from the West has not corrupted this indigenous missionary; it has simply revealed that he was not qualified to begin with. The pastor from the West was wrong in recommending a man whom he had known for only a few days and that he could not hold accountable on the field. We often fail to realize that missions must be guided by the principles found in God’s Word and not by enthusiasm, sentimentalism, or romanticism. Men and women should be supported only after careful and prolonged scrutiny. They must have a solid testimony and a strong reputation among the churches and elders who know them best. We must never forget that a foreigner is easy to deceive. Throughout America’s history, we find unscrupulous people who have made fortunes by deceiving the immigrants who came here from other countries. It is a simple truth that anyone is more susceptible to deception when coming to a land where the language and culture are not their own. Well-meaning Christians are often the most susceptible to such deception. For these reasons, and many more, the support of indigenous missionaries must involve indigenous churches and elders with long-standing and worthy reputations. It is easy for an indigenous candidate to deceive a North American Christian for a few days, but it is nearly impossible for him to deceive a biblical and Spirit-filled group of indigenous pastors who have scrutinized his life in the light of the Scriptures for an extended period of time. Having worked through the arguments against supporting indigenous missionaries, my conviction and desire to form a society for their benefit continued to grow. But how should such a society be financed? It seemed good that we should not actively raise money or prod others to meet our needs. If God were truly behind the vision, then He would be its Sustainer. Thus, we set out by faith and began to support a few Peruvian church planters. We figured that if God provided for their needs, then we would continue to expand according to the doors that He opened and the resources that He provided. From such a small and feeble beginning, God has enabled us to support national missionaries, distribute Scripture and Christian literature, and provide tools for evangelism in Latin America, Europe, Africa, the Middle East, Russia, and Asia. All this has been done, not according to our faith, but beyond our faith and even in spite of our frequent unbelief. If anything worthy has been accomplished in this ministry, it is the result of the absolute sovereignty of God and His willingness to use the lowliest and weakest in order to confound the wisdom of the wise and embarrass the strength of the strong. It is our great desire to see the Gospel preached to all nations. We believe that it is God’s will for us to trust Him as never before, to call upon Him in prayer as never before, and to expect great things from Him as never before. It is our hope and prayer that God might raise up an army of indigenous and cross-cultural missionaries to carry the light of the Gospel into the darkest and most forgotten places on earth. We trust in His absolute sovereignty, and we rest in the certainty that He will call forth a people for His Son. 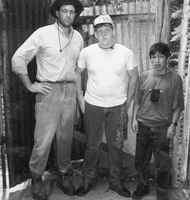 Our first church plant experience with Homer Crain in Ventanilla, Peru (1988). A second building (made from shipping crates) was added the next year (1989). One of the first families in the church: Refugees from the central mountains. 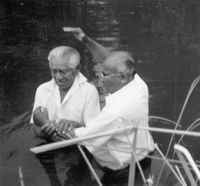 One of our early baptisms from the Church of the Savior in Lima, Peru (1990). HeartCry ministry to the street children in Mirafores - Lima, Peru (1991). The children's physical needs were only surpassed by their need for the Gospel. One of HeartCry's first conferences in the northern mountains of Peru (1990). HeartCry begins distributing Bibles in the mountains of Pacaipampa, Peru (1991). HeartCry begins aiding churches in land purchases and construction (1991). HeartCry helps build a chapel for the lepers of San Pablo, Peru (1996). HeartCry's first mercy project - a prosthesis for a little girl in Peru (1991). 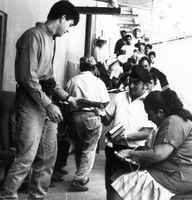 HeartCry distributes clothing for needy pastors in northern Peru (1993). Open-air preaching in the northern mountains of Pircas, Peru (1993). HeartCry purchased this van to carry preachers to the mountains of Peru (1994). HeartCry purchased this boat to carry preachers and Bibles on the Amazon (1996). HeartCry provided bicycles to missionaries in the central jungle of Peru (1996). 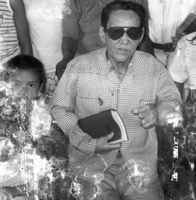 Men like pastor Angel Colemenares were the motivation for founding HeartCry. Angel would travel any distance and suffer any hardship for the Gospel. It is believed that over 500 churches were planted as a result of Angel's life. Angel preached the Gospel to old and young. He especially loved the children. Brother Lucho (born blind) loved Jesus, preached the Gospel, and discipled men. Jorge was a blind and crippled leper who carried the Gospel to the Amazon. Sister Dorris gave her life to the Aguaruna Tribe. Her devotion left a mark. 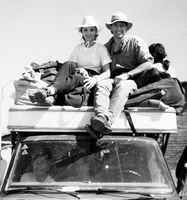 Paul and Charo Washer traveling through the northern mountains of Peru (1993). Paul Washer and Company after a very difficult week on the Amazon River (1994). Charo headed down the Marañon River (1994). Paul fishing for breakfast near the village of Aserradero, Peru (1995). Paul playing with snakes near Iquitos, Peru (1996). Charo at a Bible conference in Pircas, Peru (1993). Paul helping with road construction in the village of Nuevo Tingo, Peru (1997). 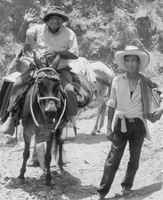 Paul and Paco Laos (ball cap) traveling on the Marañon River, Peru (1994).